My intention after the last blog post was to share pictures of our constructed cabin that we’ve managed to almost finish at our off-grid property. However, this past fall, winter and spring, have done anything but go according to plan. So, this blog post serves several purposes. It’s a PSA of sorts for anyone who reads it, and an exercise in therapy for me. November 3, 2014, our lives changed drastically. My husband was not acting himself – unable to talk, losing the use of his right side and in general acting very confused. This after having been sick vomiting 2 nights before. Once I realized that he wasn’t just ignoring me because he felt too rotten, I took him to the emergency room, fearing that he may have suffered a stroke. Once we arrived, we found out it was actually much worse. He had been fighting a sinus infection off an on for the past several months. He had experienced terrible migraines as well. It just seemed like he was sickly or sick and just couldn’t shake it. He just hadn’t felt like himself for a long time. In August of 2014, one of his teeth died and had to be pulled. The dentist said he couldn’t tell him why it died, but he could do a root canal or just pull it. He elected to have it pulled. It had just been one thing after another, something constantly wearing him down. The real problem was that the sinus infection he had been suffering from had actually eaten through his skull, through the membrane that covers the brain and was now actually on his brain. There are so many details I could bog down this post with, but I will try to stay at a level that keeps interest. I must tell you though, that I could not comprehend the extreme severity of the problem. I was still thinking stroke. But, the fact that once we were called into the triage area and medical personnel suddenly started moving very quickly, I should have known something was up. An initial CT scan revealed the issue, followed by an MRI. IV antibiotics were started in the ER exam room while we waited for a bed in ICU to be readied. The ER doctor explained to me that a neurosurgeon would be meeting with me once we got to ICU after he had examined the MRI results. I was in a complete state of shock. Completely unable to process all the information being thrown at me. Still not realizing the absolute severity of the situation. Once he was settled in ICU, his nurse asked if I had any questions. I asked the obvious – how long were the antibiotics going to take to finish so we could go home. I must have sounded like I was completely out of my mind. She was an absolute doll, and in a way that wasn’t condescending, explained in detail exactly what was going on. The infection was sitting like a ball, lodged in between the brain and the skull. It was so big in fact that it had caused his brain to shift within his skull to the right. There were 2 big concerns. 1) If the infection was just sitting on the surface of the brain, the neurosurgeon would be able to hopefully clean it out and remove it. If however, the membrane that covers the brain had begun to grow over it, then it would be more like a brain tumor and could possibly be inoperable. 2) How much irreversible damage might have been done to the brain. After meeting with the neurosurgeon and an ENT, surgery was scheduled for that Friday to allow a few days of antibiotics and try to get him more stable before proceeding with such a traumatic procedure. The doctor explained that they would do a culture of the infection so the proper “cocktail” could be administered. He also explained that this infection had been in his sinuses for YEARS – that it takes a very long time for bacteria to eat through bone. They would perform the surgery together to remove his sinuses along with attacking the infection on the brain. My husband was mostly sedated for the next couple of days. Everything was geared toward getting him stable enough for surgery. By Wednesday evening, he was having seizures. Thursday morning, the decision was made to intubate because he had lost the ability to swallow. He was breathing fine on his own, but they were concerned that he would aspirate and quite literally, drown on his own saliva. After he was intubated, another CT scan was performed and the decision was made to take him to emergency surgery because the infection had invaded another part of his brain. 3 hours later, he returned to the room. I was told that he would remain in a medically induced coma for the next several days. The brain is a muscle. So, much like when you sprain an ankle, it needs rest to get better. The coma was necessary to avoid stimulation of any kind and let the brain begin to heal. There was an endless parade of doctors, speech therapists, physical therapists, directors, supervisors, counselors, nurses, respiratory therapists and social workers day after day. Everyone kept telling me we would have to “wait and see” and “hope for the best” and “make sure you are taking care of yourself” and talking about “preparing myself for the possible limitations he might have”. Not one of them actually came out and said “he may still die”, but in essence, that’s what they were trying to tell me. Please – look at the recap so you can appreciate the severity of this with me. It took me a couple of weeks to wrap my head around this. He was admitted into the hospital on Monday, and with each passing day, even while receiving antibiotics that were so strong had to be approved by the CDC and the hospital administrator, he was progressively getting worse. THAT’S the kind of infection we were dealing with. He had lost the ability to talk or to swallow. The use of his right side was gone, and the right side of his face had begun to droop. When I met with the neurologist after the surgery had been performed, she told me it was a good thing I had gotten him there when I did – he was down to hours of being alive. Hours. A culture of the infection showed that it was streptococcus constellatus. It was explained that this is one of the more “puss-ey” forms of strep, so its able to spread quickly through the body, infecting everything in his path. Much like battery acid or mold. Just grows and grows as long as it has something to feed off of. 14 total days were spent in ICU. 3 days were spent in PCU (a downgrade from ICU), and 4 days were spent in a regular room. During this time, speech and physical therapy were being performed, along with the endless parade of various caregivers. Then he was released to a rehabilitation facility for 2 weeks for speech, physical and occupational therapy, and finally came home on December 6, 2014. There was an additional 6 weeks of in home speech, physical and occupational therapy. I was trained how to administer his antibiotics through his PICC line twice a day for those 6 weeks as well. Once a week, a nurse came to draw blood and change the PICC line dressing. Here’s the PSA part. Follow your instincts. If your instincts tell you something isn’t right, it usually isn’t. Push for a second opinion from your doctor. Push for more tests. If after 4 rounds of antibiotics, you still have an infection, there’s something else going on. Don’t accept things as “just getting older”. My husband has always had sinus trouble with allergies and sinus headaches, so at first, the recurring infections didn’t seem out of the ordinary. His father had migraines most of his life, so when my husband began having them, he thought “well, I’m 50 now, Must be my turn.” Not being able to get well, we just chalked up to being older and not able to shake things as easily. We’ve been through so many shoulda, woulda, couldas. Not only did he live, but those “limitations” they were concerned about aren’t quite as severe. His doctors and caregivers considered him a miracle and the luckiest man ALIVE. Once he was brought out of the coma, the nurses that had been assigned to him while he was asleep would drop by. “I just had to see him!” they would say. I could never express the gratitude and love I feel for everyone at the hospital. He had an AMAZING team taking care of him. And they went out of their way to take care of me as well. I’m proud to say that on December 6th, he WALKED out of the rehab facility. Rather slowly, with the use of a cane, and with a nurse by his side ready to grab his balance belt if he stumbled, but he WALKED. It seems as though fall is upon us! It’s been perfect weather for getting outside and doing some much needed clean up of the spring/summer garden and preparing for the next growing season. In the spirit of reusing and repurposing, I’ve created a new compost bin! This is a chicken/keet pen we constructed a few years back. We used it for moving the babies into once they were old enough to leave the brooder, but still too young to move outside full time, and while we were constructing the chicken tractors that we had. It’s about 5 feet long, by 3 feet high and just a little over 2 feet wide. There used to be a door one one end, but that has since been replaced with plastic garden fencing. After the chickens had moved into their respective tractors, we kept this as a pen to separate the girls if one was hurt or just needed a “time out”. 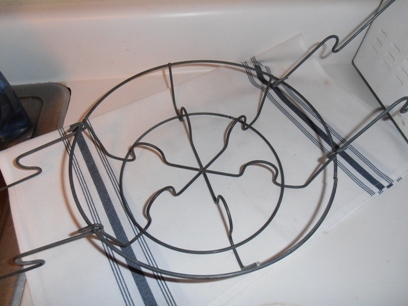 It had a wire bottom of quarter inch hardware cloth, with the top and sides being chicken wire. It was fabulous for the babies, because we could bring them out into the yard, turn it upside down with the chicken wire top on the bottom and they were able to eat grass and scratch, get some fresh air and sunshine while being totally protected. I couldn’t really figure out what to do with it, but didn’t want to toss it either. I was contemplating building a compost bin from some scrap pallets we have, but then I had this brainstorm. I removed the hardware cloth bottom (which I saved to use on a future project – whatever that may be), turned it upside down so the chicken wire is on the bottom, and decided to use it as my new compost bin! 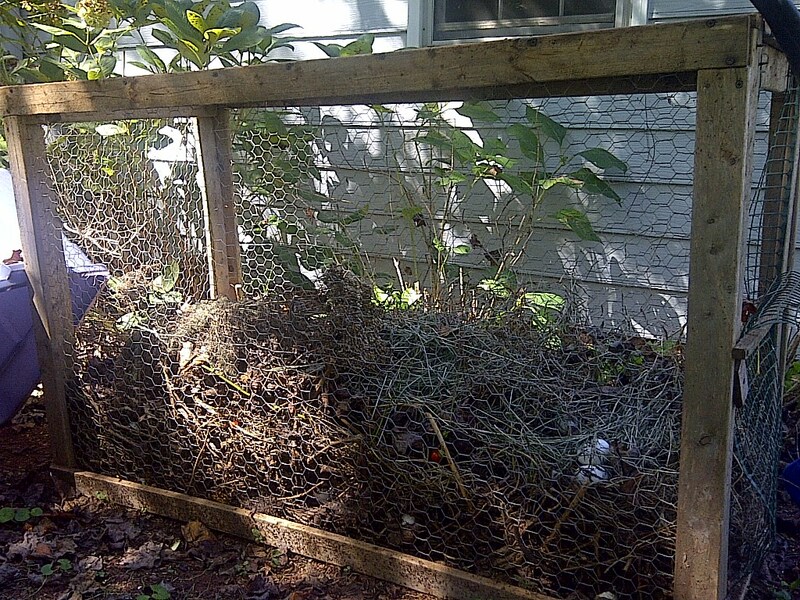 It’s my hope that the chicken wire sides will provide plenty of ventilation for the compost. And that when it comes time to harvest my compost, the garden fence “door” will be easy enough to remove for this purpose. I guess next spring, I’ll see how well it worked. First up is Our Half Acre Homestead. Mr. and Mrs. Volfie are an absolute hoot, and so personable, I just feel like I “know” them. Mrs. Volfie whips out some amazing recipes in her kitchen, along with providing practical tips and advice for food storage, preservation, budgeting and all around “you can do this too” encouragement. Next is imstillworkin. Yet another fantastic site for canning, gardening and recipes. Again, someone who is very personable, practical and easy to follow. I love her accent and sense of humor too! And last is a delightful lady that I just found yesterday. Mel at One Woman and Two Acres is quickly becoming my hero. She’s one woman, a few critters and a two acre homestead that she’s developing. She uses power tools like a boss and makes me feel like there’s nothing I shouldn’t be able to do. She’s dug a swale on her property using a shovel, made hugelkulture beds and even fixed her own water pipe break! A true testament to “Girl Power”! Her positive attitude and spirit are truly inspirational. And her laugh will make you smile. Now, I’m back out to take advantage of this beautiful day! Have a great week everyone! I hated meatloaf growing up. To this day, I consider it one of those tragic childhood memories that I try to block from my memory bank. The term “meatloaf for dinner” meant that there was about a pound of ground beef left in the fridge, some peppers, and a few sleeves of saltine crackers – all of which were on the backside of freshness. My grandma, (Lord rest her soul and please forgive me for what I’m about to say), had no desire to be a “domestic goddess” or learn any skills pertaining to such. She considered the microwave oven, and the foods packaged specifically for preparation in them, one of the greatest inventions of all mankind. Quite possibly more important than fire or the wheel. Don’t get me wrong – there a few dishes that she made that were delicious. I and my mom have tried to replicate them over the years and we just can’t. They’re just not the same. Her pot roast was heavenly. Her fried potatoes perfectly crisp and tender at the same time. And she could make a chocolate pound cake that would melt in your mouth and make you want seconds, thirds and fourths. I can’t really say too much though. When I first got married, I didn’t know how to grocery shop or cook anything from scratch either. I was a child of the 70’s , so pre-packaged food was all I really knew. It was what I had been raised on and what I was familiar with. It took a lot of trial and error before I learned to cook and bake. But I kept trying. I had a desire to whip out masterpieces for my family, taking simple ingredients and melding them together into something that would have them singing my praises ’round the dinner table. (Okay, actually I just wanted to come up with hearty and healthy meals to fill up a hungry husband and 2 growing boys.) So, began my need to make peace with meatloaf. I made it the way I had seen my grandma make it. Yep, it was still awful, just like I remembered. I tried a few recipes I’d find – some very fancy – but it still just wasn’t what I was looking for. Finally, I came across a recipe that after reading it, sounded like it might be pretty good. I clipped it and stuck it in one of my cookbooks and forgot about it. I do that a lot. I’m a bit of a recipe hoarder I guess. Anyway, one day I came across it again and decided to give it a try. Oh…my…goodness. It was better than I ever thought meatloaf could ever be. As it cooks, everyone’s mouth is watering because it smells so good. My boys called it “torture loaf” when they were little, not because it was torture to have to eat it, but because it was torture smelling it cook for over an hour. And we’re not the only ones that love it. I’ve made it for dinner for guests, taken it to potluck dinners, and shared leftovers with anyone I thought needed them. And they all rave about it too. It’s even better the next day as a meatloaf sandwich. It remains tender and just the right amount of juiciness. This is the recipe I will hand down to my future daughters in law, and will prepare for my future grandchildren. So, I’ve felt inclined to share it with you for your family to try. I’ll give you the original recipe (I kid you not – this is the actual name of the recipe) as I found it in the magazine, and then you can tweek it however you like. I’ve done the same thing over the years, adding a little more of this, a little less of that, used venison instead of beef, etc. It’s very forgiving and easily customized to your taste. 1. Heat oven to 375 degrees and prepare large roasting pan. 2. Melt butter in a large skillet. Add onion, scallions, bell pepper and garlic. Cook uncovered over medium heat about 8 minutes until vegetables are soft. 3. Meanwhile, beat eggs with a fork in a large bowl. Stire in 1/2 c ketchup, the milk, Worstershire sauce and salt. Add onion mixture, meats and bread crumbs. Mix with your hands or a wooden spoon until well blended. 4. Place in pan and pat into a 12″long, 5″ wide, 2″ high loaf. (I just make it in a 13″ x 9″ pan. Meatloaf doesn’t necessarily have to be a loaf in my opinion.) Brush with remaining ketchup. 5. Bake 1 hour 15 minutes or until meat thermometer inserted in center registers 155 degrees. Let stand for 15 minutes before slicing. Now, I am highly allergic to bee stings and most bug bites. My skin is anyway. Thankfully, I’ve never suffered from anaphylaxis, but I’ve also never been “attacked” by a swarm of bees or such either. My reaction might be much more severe in that case. I did get a bad case of chigger bites last summer, which resulted in horrible welts from the bites and I felt like I had the flu until they healed. Usually I encounter a LOT of swelling of the sting or bite area and just have to keep a close eye on it. I keep a bottle of Benadryl around at all times. Best first aid is to usually wash the area, use a paste of baking soda to remove any poison and make sure there are no stingers or anything left behind. It’s also why I ALWAYS usually wear gloves when gardening or working outside. My biggest fear is not knowing WHAT might have stung me or bit me and then I wouldn’t know how to treat it or if I needed to seek medical attention. And I never, ever, never just stick my hands under or in areas that I can’t see into first. Even without an allergic reaction, you can’t be too careful. Spider bites, scorpion stings, snake bites, etc. are nothing to play around with. Especially if it’s something that may zap you and then run off, so you’ve no clue what it was. A brown recluse? Oh, shudder the thought! Better safe than sorry! 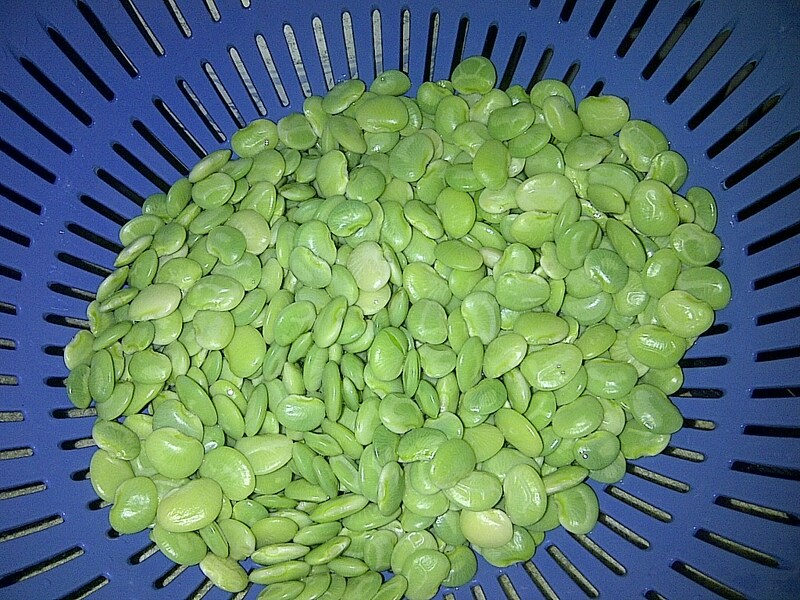 After the Benadryl foggy coma wore off, I did manage to resume my harvesting (in gloves, of course) and was rewarded with quite the haul of lima beans! I spent the time during the hottest part of the day shelling my beauties. (I’m adding a bean sheller to my Santa wishlist, by the way). I washed them, blanched them for two minutes in boiling water followed by an ice bath. All total I had 1 1/2 quarts baggies for the freezer! I’m so excited! These will make for some gooood eating through the colder months. A piping hot bowl of FRESH lima beans and some buttery cornbread and I am a happy homesteader indeed! We’ve enjoyed eating them over the summer along with mashed potatoes and fresh sliced tomatoes and cucumbers straight from the garden. They are so flavorful and sweet and tender. Certainly stepping up the quantity and variety of beans for the next summer garden. And that’s a good motivator to master pressure canning! Oh, friends and dearhearts! So much has been happening the last 6 months! My blog isn’t the only thing that has been neglected – my house has too and it’s time for some Fall Cleaning as opposed to Spring Cleaning and it’s a wonder I’ve been able to harvest anything out of my pitiful garden. I’ll just touch on some of the highlights. Just as my garden that I mentioned in my last post was starting to sprout, a Bradford Pear tree decided that after 25 years, it had had enough. And just WHERE do you suppose it decided to rest it’s weary head? You guessed it – right across my garden! ~sigh~ It’s ok though. I’ll try for those same goodies again. They were sprouting! They were growing! It was working! After having surgery to unblock her 95% blocked carotid artery, my mom had a stroke. It wasn’t too terribly bad and she is on the mend. Convincing her that she does NOT know more than her doctors and trying to get her to follow their orders so she stays on the mend is another story all together. In the midst of this, both (yes, I wrote BOTH) our trucks have ceased to be running. They’re not a total loss, but they have exceeded my dear sweet husbands mechanical knowledge. Bless his heart, he exhausted several hours and gallons of blood, sweat and tears before finally admitting defeat. It wouldn’t be that big of a deal if my job was still on the bus line, but my office is 25 miles away. A lot of my time has been coordinating a ride to and from. Thank God for my 23 year old son, his fiancee, and my aunts! A car payment is absolutely not in the budget currently, but the parts to fix the old clunkers are. We do have a mechanic friend who is going to help out. We’re confident that he can get at least one of them fixed. Once he has the time. Guess he’s got a life or something with working full time and 2 kids and a wife that works on the weekends. ~sarcasm~ Lol! My husband found a full time steady job, but after just about 4 months of employment, his position (and a few others) was eliminated. I suppose it was for the best. Seemed to be a great deal of mis-management going on. Most days he came home so wound up and frustrated, we were really asking ourselves if the money was worth it. I guess God answered that question for us. I have to say that there was actually a sense of relief when he told me. Mental and physical health are far more valuable than any amount of money you’re making. We’ve “been there, done that” with the stressful, demanding careers, and paid the price emotionally and physically. A job is supposed to be employment, not a soul sucking life draining heart attack waiting to happen. We’re too old for that crap! Doesn’t fit in with the simplistic lifestyle we’ve adopted. So, we’re back to tying knots in our shoestring budget to try and stretch it just a wee bit farther each month. I’m confident that something else will come along. My mom always tells me “God doesn’t close one door without opening another.” We’ll just have to have faith! The summer garden has done quite well! We’ve been covered up in tomatoes! Yum! Tomato sandwiches, sliced tomatoes with every meal, giving them to family members, friends and neighbors and canning, canning, canning. I actually got eggplant to grow this year! Yay me! And there have been lima beans and green beans. I’ve never grown lima beans, so I’m quite pleased with how well they’ve done and how easy they are. Gives me confidence to grow several more varieties of beans next year. Our 19 year old youngest son has enlisted in the United States Navy. Due to the job he wanted, he is on the Delayed Entry Program and will leave for basic on March 10, 2015. He’ll graduate 8 weeks later, and then head to Pensacola, Florida to begin his schooling. His career will be as an Air Traffic Controller, spending time on land and on an aircraft carrier. It is a mandatory 5 year service time, most of which will be overseas. He is super excited and proud of himself. We’re pretty darn proud of him too! Right now he has monthly meetings to attend and has to check in every week with his Petty Officer to let them know that he’s still going, he’s not been in trouble with the law, his marital status has not changed and he has no children on the way. He found out at this past weeks meeting that after graduation, he will have 2 hours to spend with us before boarding the plane for Pensacola. So, we’ve been busy spending every.single.minute that we can with him. There’s been a bazillion other little frustrations and tragedies going on that seem to blind side me from time to time, but I won’t bore you with them. We’ve had to be on our toes, trying to stay ahead of the next upheavel. I’m working hard on keeping a positive attitude and being grateful for the multitude of blessings bestowed on us. I figure any day that the good Lord sees fit to let me open my eyes means there’s still some fighting left to do and life to be lived. It was an absolutely BEAUTIFUL day today! Temps in the low 70’s, sunshine and a breeze! What better time than to get some seeds in the ground! The broccoli is truly an experiment. I only planted 4 seeds, because I want to see how it’s going to do. In my growing zone, it tends to get pretty darn hot toward the end of July, which according to the harvesting recommendation is when it will be ready. May be one of those things that I have to start earlier in the season and work to protect it from the crazy frosts we have from time to time before the middle of April. I try not to get my heart set on plants that are experiments, just in case they don’t work out. But, at the same time, I’m hopeful. It felt so good to be out there with my hands in the dirt soaking up the Vitamin D! As I sit here now, my back and shoulders are aching, my knees are as muddy as a 4 year olds, and my nails look terrible! Will certainly have to take the nail scrub brush into the tub with me tonight, where I’m sure to leave a satisfactory dirt ring. But I wouldn’t trade a thing! There is something quite fulfilling for the mind, body and spirit after a hard day of enjoyable work outdoors. It was very pleasing to sit on my porch swing, looking over the newly planted and mulched garden, with the little markers in place, daydreaming about walking out my back door for salad fixings in a few weeks! Until next time, take care and I hope you’re all starting to see spring around the corner in your neck of the woods! It appears one of my garden experiments is working! I decided to get my hands dirty and do some manual labor out there. Best exercise in the world! 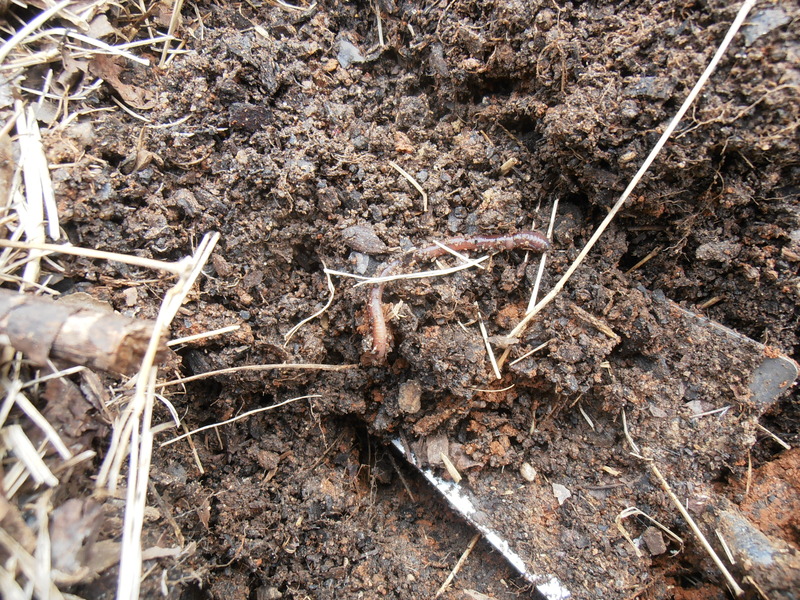 Turned the compost pile and added another layer or two. Then grabbed my trowel for a look-see at what might be going on in the garden plot. Part of it was still frozen solid. 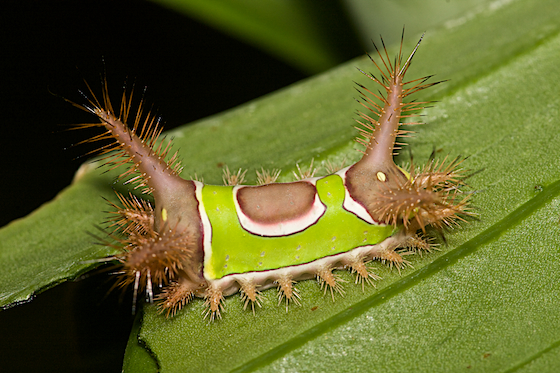 I did find a D-E-A-D grub in another area (yay! ), and then I moved to the experiment area. I figured since it gets the most sun during the day, it was probably thawed and I could get a good indication of what was going on. This is what I started a few months ago. I tossed out a couple buckets of kitchen scraps. 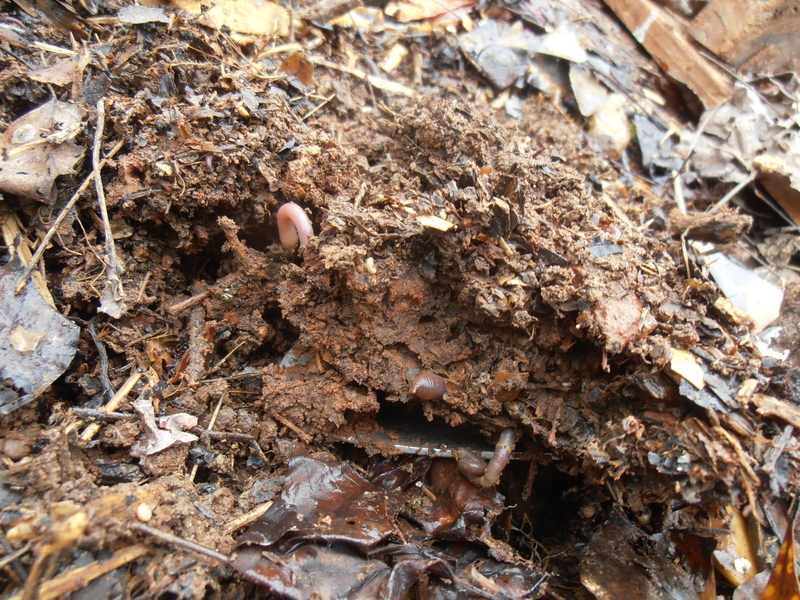 Just normal compost items – egg shells, coffee grounds, tea bags, veggie scraps – then covered with a thick layer of leaves. On top of that, I laid some cardboard, then weighted it down to keep it from blowing away with some scrap wood. Worms! There’s worms in there! They’re not too lively due to the colder temperatures, but they’re THERE! And in all sizes too! Big fat juicy daddy worms and teeny little baby worms all wriggling around in happy family unison! I cannot WAIT to see how it progresses in the next couple of months as the temps continue to warm up! Thought I’d share a few of the priceless treasures I’ve found over the last couple of weeks! I found this little canning rack tucked at the back of a shelf of kitchen items. This will come in pretty handy this spring and summer when I’m canning. 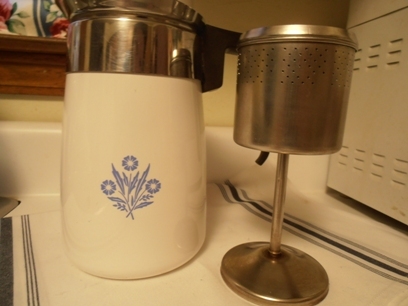 Now I’ll be able to have the water bath canner and a regular pot going at the same time! And for $1.51, why would I even try to resist? 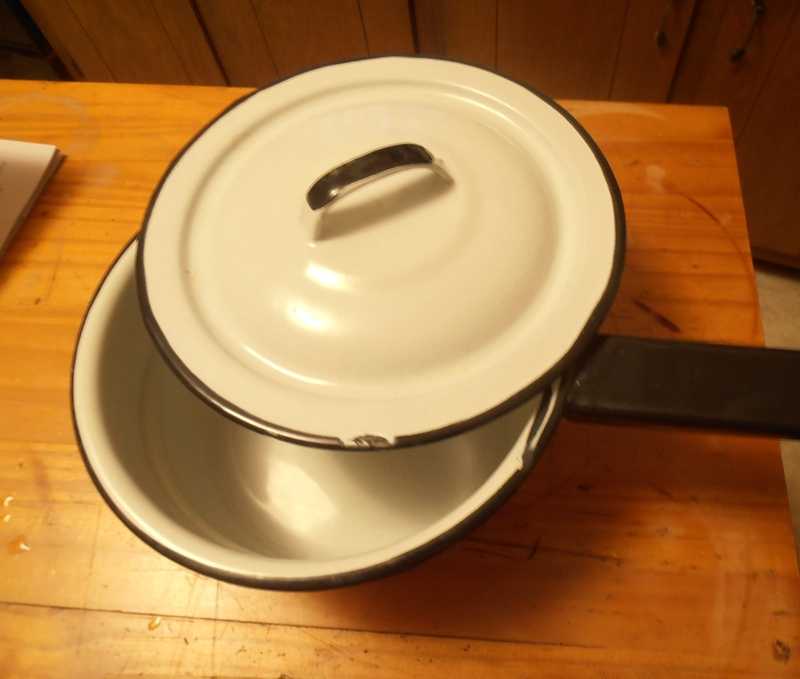 This adorable little metal pot is perfect for warming up a single serving of something on the stove, boiling eggs, and such and it will be great to take camping with us. And it had the lid! That’s a rare find! $1.81 you say? I say, welcome to my home! 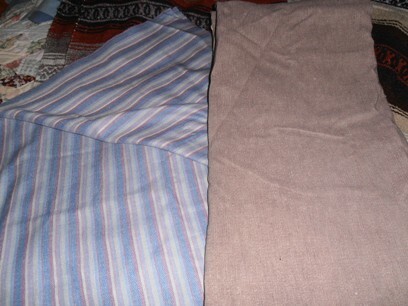 These blankets were a steal for $4.54 each! They’re the perfect size to cozy up with when curling up to read a book, or if I just need my tootsies covered while I crochet. They’re heavy, yet soft and pliable. Furthermore, they’re cat approved, for “kneading” and piling up for a good afternoon nap. Of course, no trip to the thrift store would be complete without snagging some craft supplies. I found ALL these fabrics for less than $10.00! Can you believe it?! 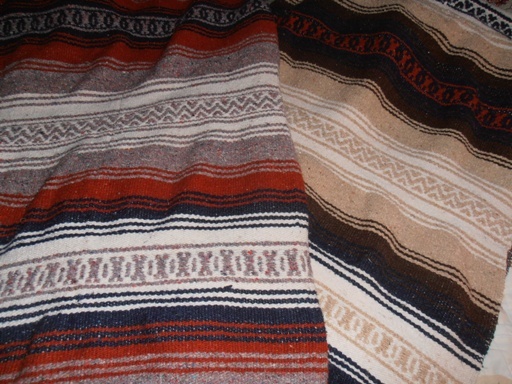 I believe these are some type of upholstery fabric. They’re very thick and heavy. I’m thinking maybe some chair cushions, or maybe even some tote bags. I had to have these just because they’re so pretty! Perhaps and apron, or a skirt for Spring. Maybe a head scarf or two? 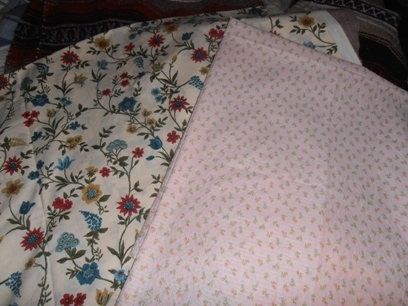 The print on the pink fabric is small enough that it might make a beautiful little doll dress. Of course I caused a bit of a scene when I squealed upon finding THIS fabric! I guess there’s just something disturbing to some people about a 43 year old woman dancing in place, squealing “It’s chickens! Look! 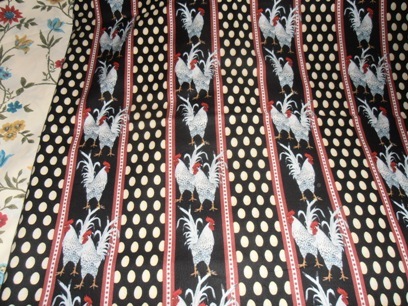 It’s chickens!” It’s adorable and I could not think of a more perfect fabric for ME of all people to dig out of the bin. My thought for these is a set of cafe curtains for the homestead cabin, if there’s enough fabric. If not, a good friend of mine had the suggestion of bordering with a coordinating fabric to make it big enough. Ingenious! Just LOOK at all these goodies! For less than $20! Everything functional, practical, and useful. I love it! This article came across my Facebook page today, and I thought I would share it. I love coming across things like this. Seems I’m always having to be reminded to be patient, and that progress is progress, no matter how small. I just get so caught up with all the ideas rolling around in my head and my vision for the complete picture, that sometimes I drive everyone crazy! I have several notebooks stashed all about the house that I record all sorts of things in. I have countless drawings of garden plans, chicken coops, pasture areas, house plans, kitchen designs – even a clothesline pulley system! I just can’t turn my brain off once I get going most times. I’ve also collected canning recipes, canning hints, wood stove cooking tips, outdoor cooking tips, food storage tips – anything I can get my hands on! If it’s new to me, or something I want to try, I jot it down and do my best to implement it. I find articles in magazines, or things I print from the internet, and put them in page protectors and organize them in 3 ring binders. Gardening notes, favorite varieties of seeds, where items were purchased and for how much. Now…what I really need to work on, is keeping up better with where I put things. Seems I’m always asking “Where did I put that?” I’m thinking I need to either consolidate everything into one huge binder with dividers and keep it one designated place. Or, I need to categorize everything into smaller binders and keep them in the place where they make the most sense (i.e. cooking binder in the kitchen, gardening binder with the seeds, laundry hints in the laundry room, etc.) I’m thinking I can keep scratch pads in my pockets and purse, and once a week or so purge those scratches into the appropriate place. And I would need to designate a place where all my scratch lists go so I’m not walking around with pockets full of little pieces of paper! Planning and patience….and breathing. Musn’t forget to breathe once in a while. Good grief! I can’t believe I haven’t written a blog post since August! That’s shameful! I simply must do better about posting. Writing seems to be the best therapy there is. I tend to have so many thoughts tumbling around in my head,and really need to be better about channeling them. We made it through the holidays and are still struggling with the rain. If it were just cold weather, well I’m sure we could put on enough layers to stay reasonably comfortable, especially once we get moving about. But rain, that’s a whole different story. You certainly can’t build structures out in the rain, nor can you set about shoveling and expanding the garden, etc. And then when it does actually stop raining, everything is too mucky to work in. Blah! Nonetheless, I’ve been doing a few garden “experiments” for the upcoming year. I’ve expanded my garden plot somewhat, have dismantled all the raised beds we’ve had in the past, and have 3 compost piles going. Each pile is being worked differently, so I can see which method will give the best result. One compost pile is actually part of the new plot expansion. I laid down cardboard over the grass area and moved the soil from the last raised bed on top of it. It’s no wonder I didn’t have anything grow well in this raised bed last year. The soil was absolutely dead. No worms at all. Too much store bought hummus and potting soil mixed in with red clay and topsoil. So I had this crazy idea of trying to bring it back to life. For the past few months, I’ve been layering kitchen scraps, paper, paper bags, egg shells – normal compost stuff – with leaves from around the yard. My hope is that come spring, I will have rejuvenated it a bit. I still plan on mixing in some growing mix that I’ll obtain from the local landscape supply and some more seasoned compost from another pile. Guess I’ll just have to wait and see what happens. Work all but stopped at our future homestead property over the fall due to finances and, you guessed it, RAIN! But, that’s ok. Part of this whole homesteading adventure is learning patience. And realizing that any small bit of progress is still progress forward. We did have a break in the rain and an actual nice day yesterday. We went to the property just for the day and managed to clear out some downed trees and brush and dispose of them. Some of it was burned, some was sorted for cutting down for firewood. If it was already starting to rot, turning into dirt, we either left it where it was or moved it to a couple of areas we’re planning as hugelkultur beds. Anyways, I think we appreciate it all the more having to do it a little at a time. How boring would it be to just run out to the building supply superstore and run through with wild, reckless abandon loading up the truck with all the building materials we could haul? And then to be able to take a solid couple weeks off of work to just go play in the woods and build structures and organize the place- boooorinnng! Lol! It has been quite fun scoping out free pallets, scouring the thrift stores for hinges and paint and other materials. It’s always an adventure picking up something at the thrift store or “rescuing” something from a dumpster, discussing how we might be able to re-purpose it and incorporate it into the building scheme. More than one way to skin a cat, right? We’ve even managed to barter for some wood with a neighbor at the property. He has a huge pile of oak 2″ x 6″, 2″ x 4″, planks and 1″ x 6″, that he said we could have whatever we needed in exchange for building a a new roof for his well house. How cool is that?! While we’re on the subject of free building materials, allow me to share this valuable piece of knowledge. Keep your eyes out on Craigslist or Freecycle for folks getting rid of playsets in their backyards. You know, the ones that are made out of “logs” with the slide and swingset attached. There’s almost always someone looking to get rid of one because their children have outgrown it, or some other reason. Anyway, they don’t want to fool with taking it apart and trying to dispose of it. So, if you’re willing to spend a couple of hours dismantling it and hauling all of it away, it’s yours! (Ok, the men folk were willing to dismantle and load, but us women folk were very proud and happy of them!) Our partners and ourselves have managed to score 2 of these and there is a TON of materials taht can be re-purposed! Absolutely for FREE! Not to mention, we’ve acquired a couple of cool slides, swing seats, a ships wheel and a steering wheel. They’ve made for quirky decorations, and I’m sure at some point we’ll all incorporate them into a playset for future grandchildren. Or for the future goats. You never know what else you might get either. At one of the playset tear downs, the homeowner asked the guys if they needed a grill or empty propane tanks – they were free too if they hauled them off. So they brought them home, and one of them has been re-purposed into a little rocket mass heather for our cabin! It’s adorable! I’ll post pics in my next entry. My whole point is, the old saying “one man’s junk is another man’s treasure” has an especially important meaning to us. Working with such a small budget really makes us use our noggin to get the job done, and forces us to be resourceful. And it really does make us appreciate it all the more. Kind of raises the level of pride that we feel. Our goal is to have the cabin at the homestead completed by spring time. Our thinking is that we will be much more productive when it’s not taking a couple of hours to set up camp once we drive to the property. It’s a 2 hour drive there, and by the time we get the tent set up and everything off loaded, half the day is gone. (As is our energy.) It really does become more like a camping trip rather than a work weekend. And then we have to allow time for tearing everything down and packing up and the drive home. It’ll be very nice to have someplace with actual walls and already stocked with cooking items and such, so all we’re bringing with us is food and a change of clothes. My quest to lose 277 lbs. A documentary of the processes of potager gardening, gardening with children and preserving the harvest. I Blog About Traditional Cooking & Homemaking, Organic Gardening and Natural Living. I am also an Ambassador for Simple Green Smoothies. Take the road to discovery with us! Inappropriately documenting my journey into the homesteading world. Raising backyard chickens on a suburban homestead.